First off, let me say Happy Veteran’s Day! I’m thankful for all those who have served in the past and present and I’m proud to have the privilege to serve with some pretty incredible people. I’ll be standing the watch from Miami tonight. Secondly, I’d like to apologize ahead of time for the number of pictures that I’m putting on here of this treat! 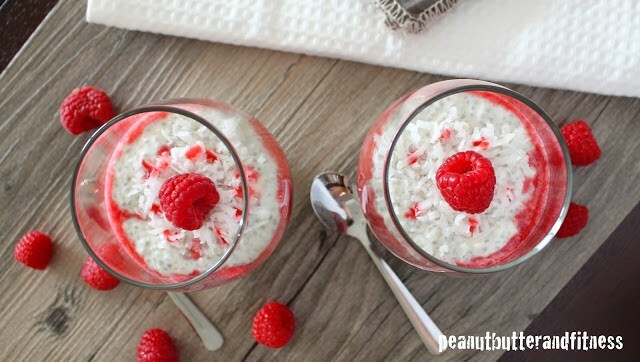 I mean seriously, this may have been one of my favorite food blog photo sessions. It’s just so pretty, I couldn’t help myself! 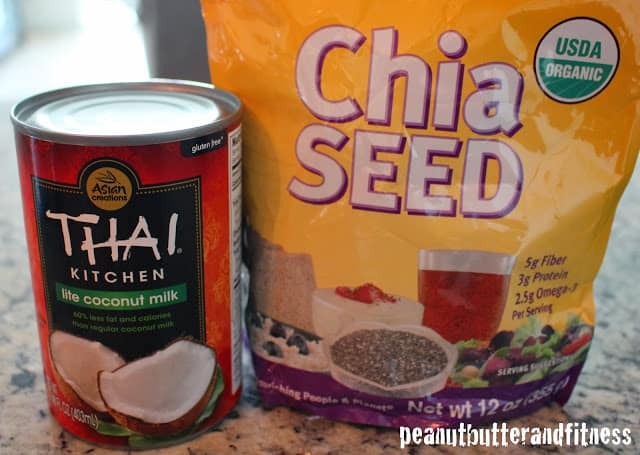 My very first blog post had some chia seeds in it, but in case you haven’t seen that one (don’t look now, it’s bad), I’ll review some of the awesome-ness that is chia seeds. And yes, these little guys are the same things that grace the backs of the ’90s ch-ch-chia pets. Do those still exist?? Maybe I’ll ask uncle Google later. Anyways, chia seeds are considered a super food and come from somewhere around the time of the Aztecs. They’ve got lots of fiber, healthy Omega-3 fats, and some calcium and protein. You can check out an article here for more info. I got my bag of chia seeds on Amazon but you can also find them either in the organic section of a grocery store or I’ve also seen them somewhere near the rice/quinoa section. You can usually find the coconut milk in the international (Thai) section of the grocery store. What’s good for us is that they’re super easy to use and incorporate into recipes! Some people even use them as a substitute for eggs in recipes since they take on a gelatinous profile when you soak them in liquid. 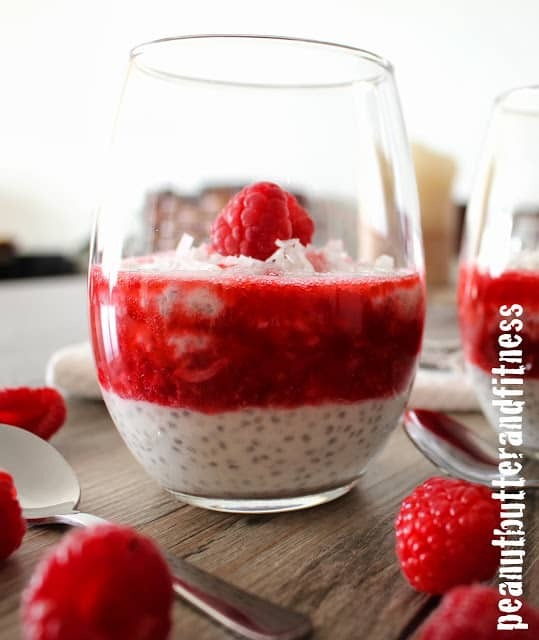 I’m a big fan of their texture when you soak them in something like what I’ve got here…you can think of chia pudding somewhere along the lines of tapioca but not quite so well defined (if that makes sense?) and definitely more healthy. Here’s what they look like when you first add them to your coconut milk/yogurt mixture for this recipe. After a few hours of soaking, they turn into little gelatin-like blobs. 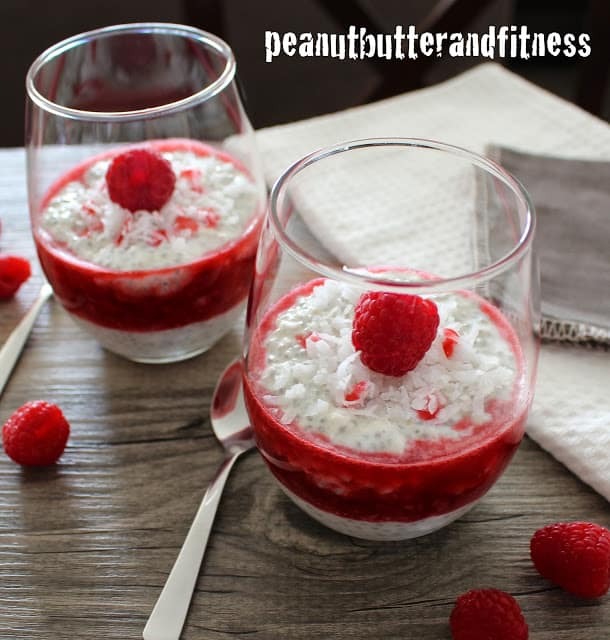 In a blender (Nutribullet works perfectly), blend coconut milk, Greek yogurt, coconut flakes, agave nectar, vanilla extract and 2 Splenda packets until smooth. 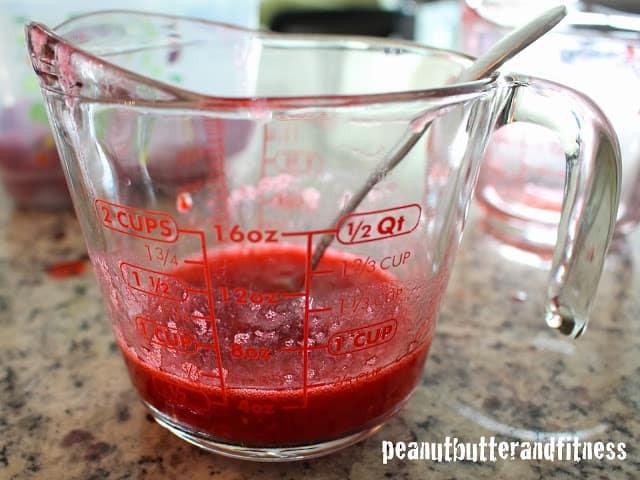 Pour mixture into a resealable bowl or container. 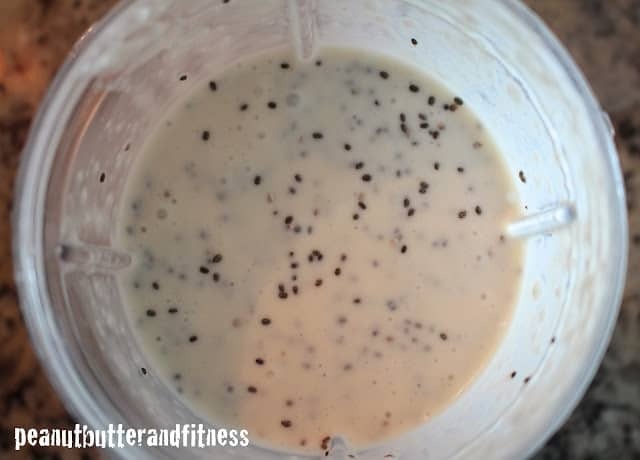 Add chia seeds to yogurt mixture and mix well, scraping any seeds off the sides and into the yogurt. Seal the container and allow it to set up for at least 2 hours in the refrigerator. 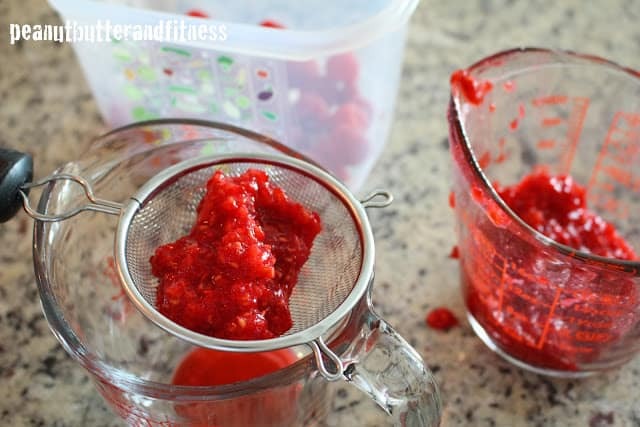 Mash the raspberries to desired consistency. Strain about half the seeds out of the mashed raspberries and discard. Stir in remaining 2 packets of Splenda. Once the yogurt mixture has set, remove from refrigerator and stir. Add a little almond milk to get it to the desired consistency (I used about 1 tbsp). Divide the yogurt mixture into 2 serving dishes. 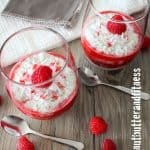 Top with a layer of raspberry mash, then more yogurt mixture. 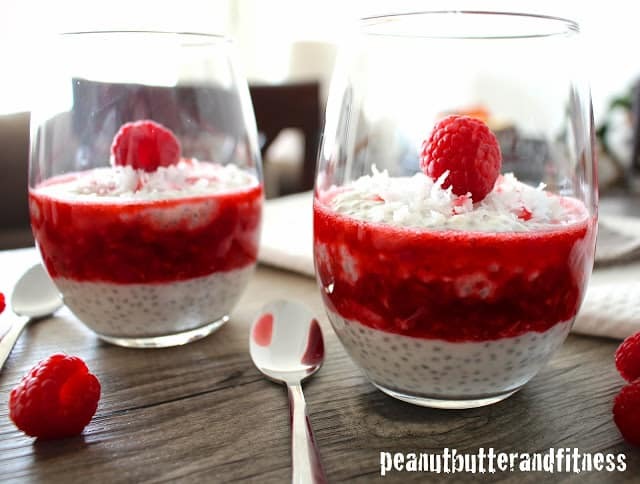 Garnish with coconut flakes and a raspberry. Enjoy! 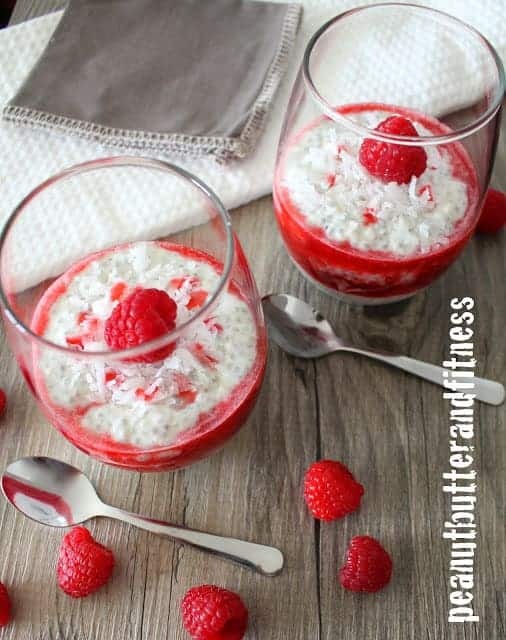 The raspberry in this recipe is the perfect compliment to the creaminess of the coconut and yogurt. I strained out about half the seeds from the raspberries that I mashed up, you could take out more or leave them all in. I personally am not a huge fan of how MANY seeds there are in raspberries but I wanted to keep some of the thickness they provide to the mash. I ended up with a little over half a cup of mashed up raspberries after mashing and straining one and a half cups of fresh ones. They do look really good….and nice photos!